I made my first homemade body scrub a little over a year ago. I prepared, packaged and gave my chocolate martini body scrub to all my girlfriends at our annual Christmas party. After seeing how easy and economical it was to make, I’ve been looking forward to making more. You can find my first homemade scrub here. 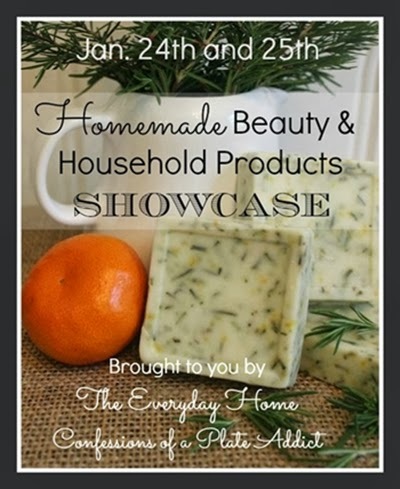 When I decided to participate in the homemade beauty and household products showcase, I knew just what I wanted to make – another body scrub. 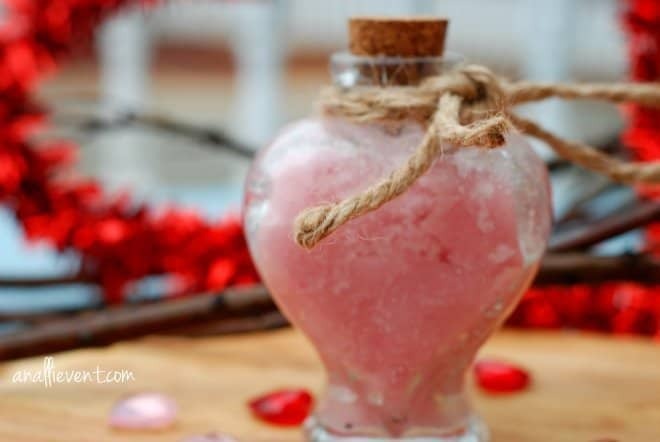 And since Valentine’s Day is just around the corner, I decided to create a pink lemonade sugar scrub and package it in a heart shaped bottle. It turned out exactly like I wanted it to and smells just like a big bag of fresh lemons. My Pink Lemonade Sugar Scrub can be used as an all over body scrub or use it to soften your hands. I like to mix a little with my body wash in the shower. Mix all by hand until mixed well and color is uniform. Package as desired. 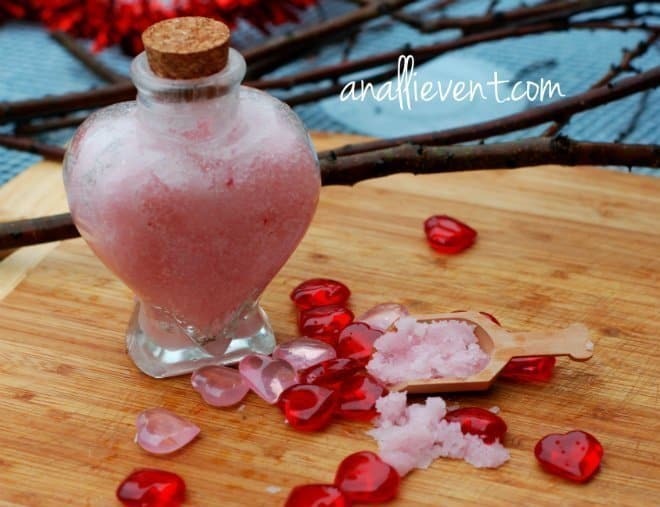 Alli, the little bottle of pink scrub looks so gorgeous and just perfect for Valentines Day. Thanks for sharing your recipe in the showcase. 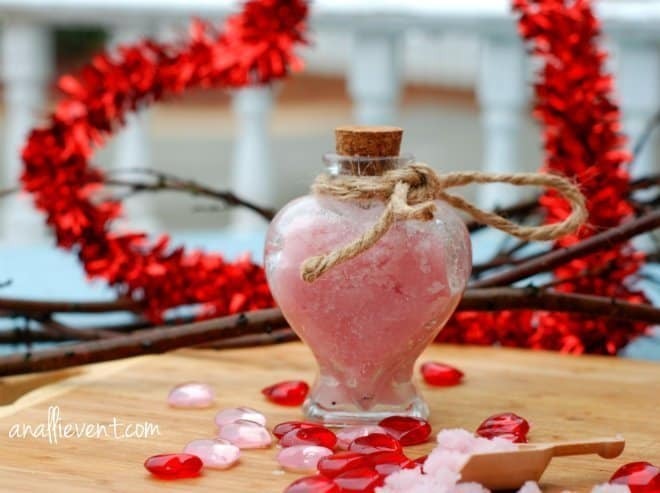 Your Pink Lemonade Sugar Scrub is a perfect Valentine’s gift. It looks good enough to eat! Would you mind sharing where you got those adorable containers and the small scoop? This sounds wonderful – looks beautiful! 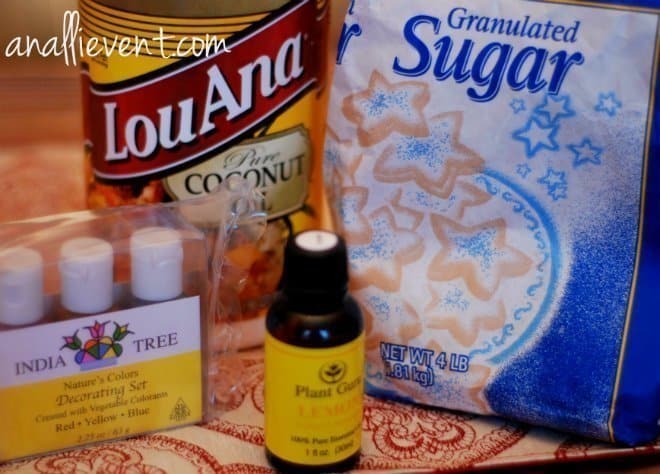 Gorgeous photos – I do appreciate you sharing this recipe! Unique scent … love it! And that little bottle is absolutely adorable! It’s fun being on the tour with you! I bet that smells amazing!!! I think this would be a great scrub to use whenever, but love that it ties with Valentines Day. Great recipe Alli. I love this, what a great idea, I can’t wait to try it! Thanks for sharing! How did I not know about natural colour?! This opens up a whole world!! Love the scrub. What a gorgeous color for Valentine’s Day… and I love the unique scent! I would also love to know where you found the tiny wooden scoop?! Love this idea and it would make a wonderful gift too! Such a cute idea to give my daughters friends for Valentines day! What a pretty and useful gift! Thanks for sharing at All Things Pretty. Pinning to my beauty board. I always enjoy a good party! My daughter just informed me that she uses my pink lemonade scrub on her lips and that it works wonders. Who knew?